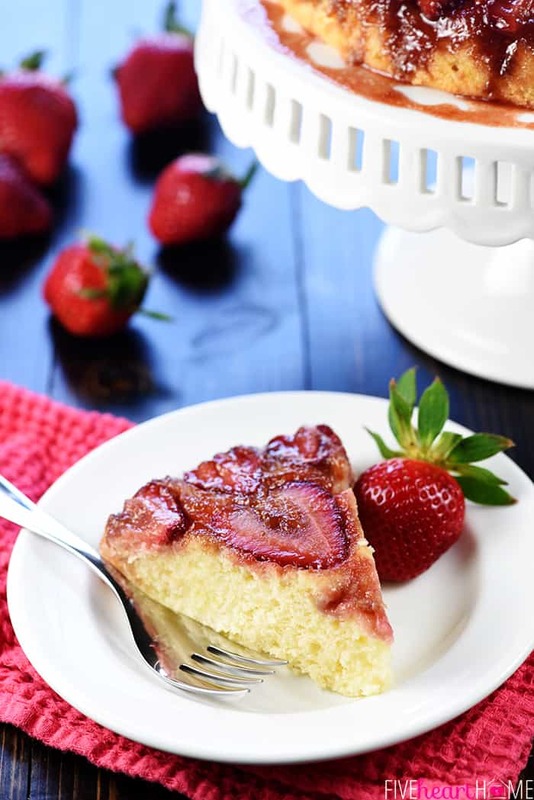 Strawberry Upside-Down Cake is a delicious twist on a classic, showcasing fresh strawberries in place of pineapple for an easy spring or summer dessert recipe! Strawberry season has arrived! And whether your part of the world is experiencing warm temps and sunny skies or bizarre and disheartening April blizzards (boooo? 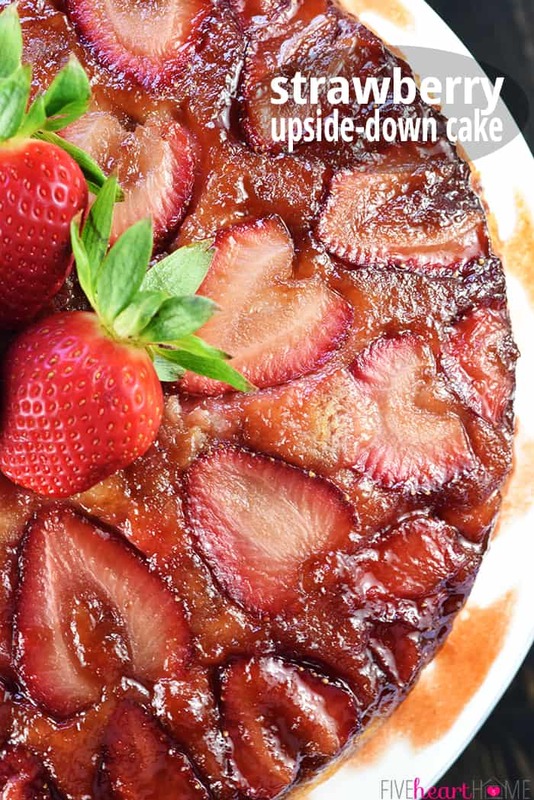 ), this Strawberry Upside-Down Cake is just the easy, scrumptious dessert recipe to get you thinking spring. 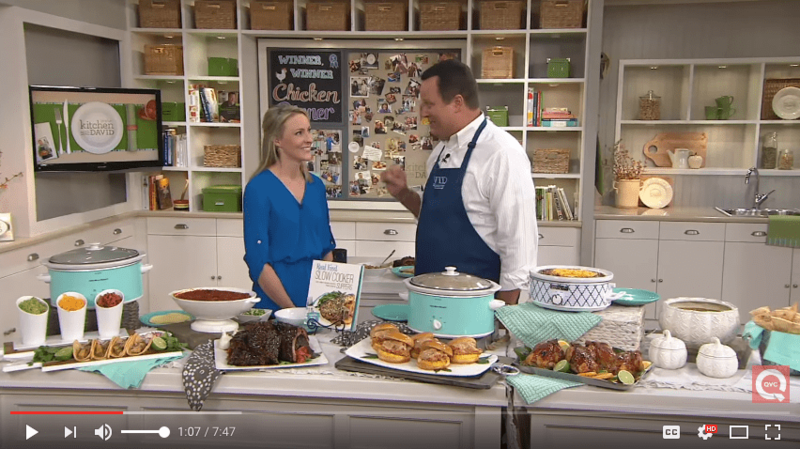 Are you a fan of upside-down cake? Pineapple Upside-Down Cake has always been one of my favorites, but since there are already approximately one bazillion recipes out there for that quintessential summer dessert, I enjoy putting different fruity spins on the classic. Several summers ago, that meant Peach Upside-Down Cupcakes. 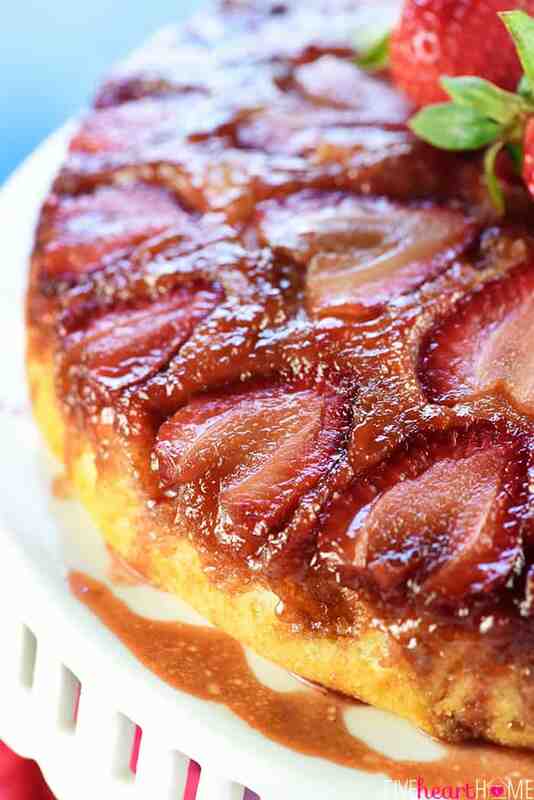 And today, I’m sharing this lovely, delectable Strawberry Upside-Down Cake! Isn’t she purty? 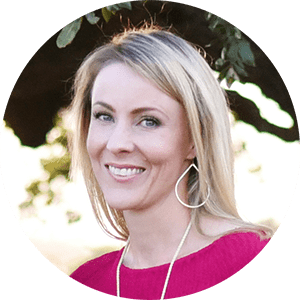 The method here is the same as your standard, homemade, upside-down cake recipe. Melt some butter in the bottom of a baking dish. Stir in brown sugar. Arrange the fruit. And spread a simple, tasty, from-scratch cake batter on top. 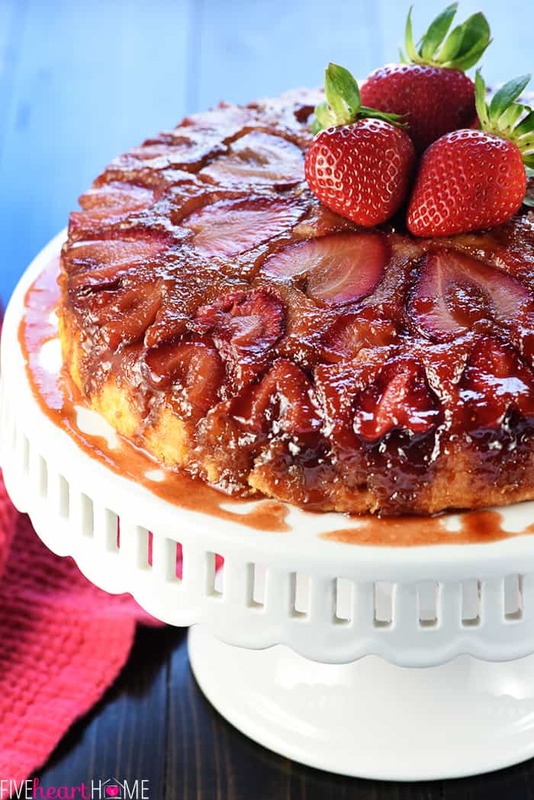 Once the cake is perfectly baked with a lightly golden top, flip it onto a platter and carefully lift the pan to reveal a glossy, gorgeous, fruit-topped Strawberry Upside-Down Cake! I guarantee it’ll put any freak spring blizzards straight out of your mind. 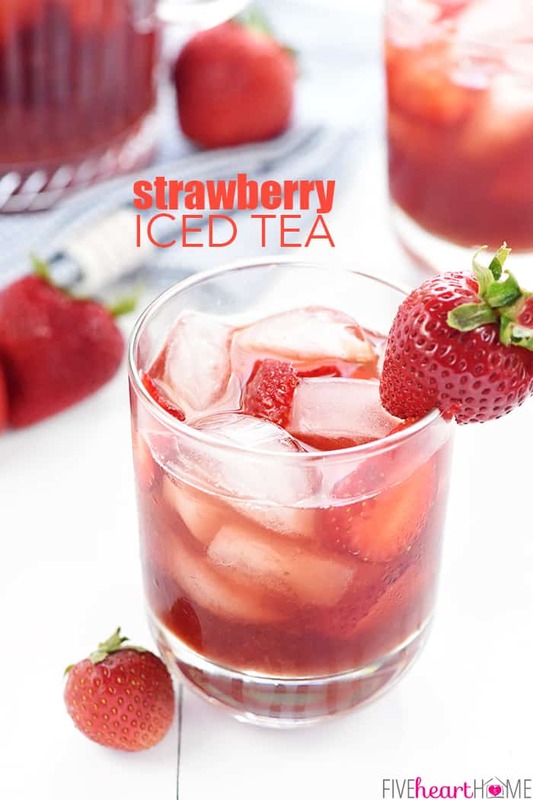 Assuming you were able to make it to the store to buy strawberries in the first place — ha. Seriously, though, how lovely is this cake?! One of the things I love about using strawberries in any dessert recipe is that if you carve a little notch in the top of each berry when you hull it, your strawberries will be all adorably heart-shaped once sliced. Furthermore, if you take just an extra minute or two to thoughtfully arrange your strawberries in the bottom of the pan, your final overturned cake will turn out all the more gorgeous. Just look at those buttery, sugary, pretty little hearts! I actually arranged all of my cut-side-down strawberries in a circular pattern by size. I can’t be the only type A OCD symmetry enthusiast ’round here, right? 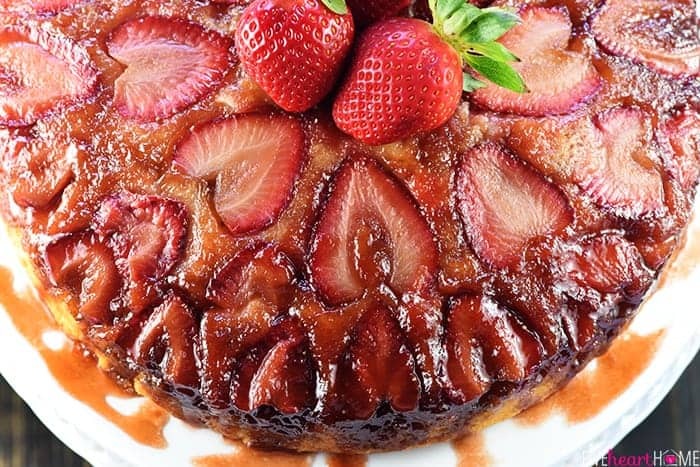 That being said, if you want to just slap your sliced berries in the pan in no particular arrangement, your Strawberry Upside-Down Cake will turn out nice and rustic and every bit as tasty. Because there’s no shame in fruit-shaped fruit that hasn’t necessarily been sorted by size.? So celebrate spring — and keep the festivities going all summer long — with this simple, beautiful, homemade cake. 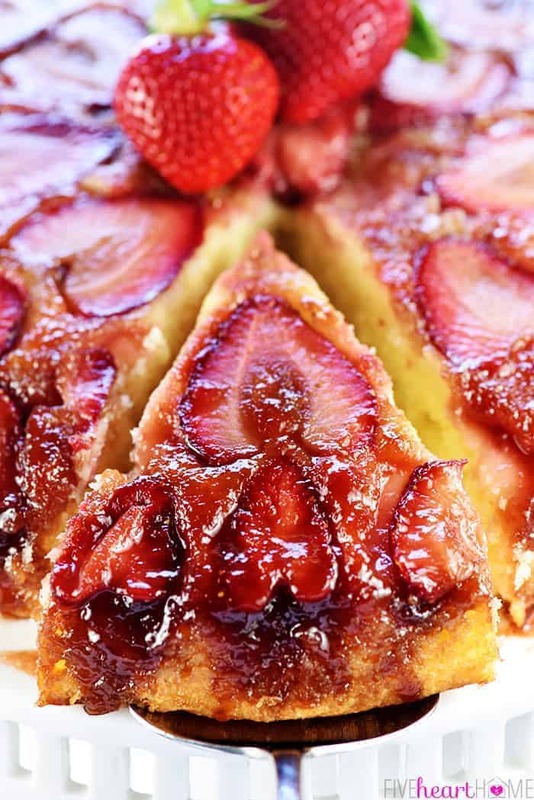 Strawberry Upside-Down Cake is a drool-worthy twist on a beloved classic. And if you like the original pineapple version, you’ll love this berry-licious update! Enjoy. 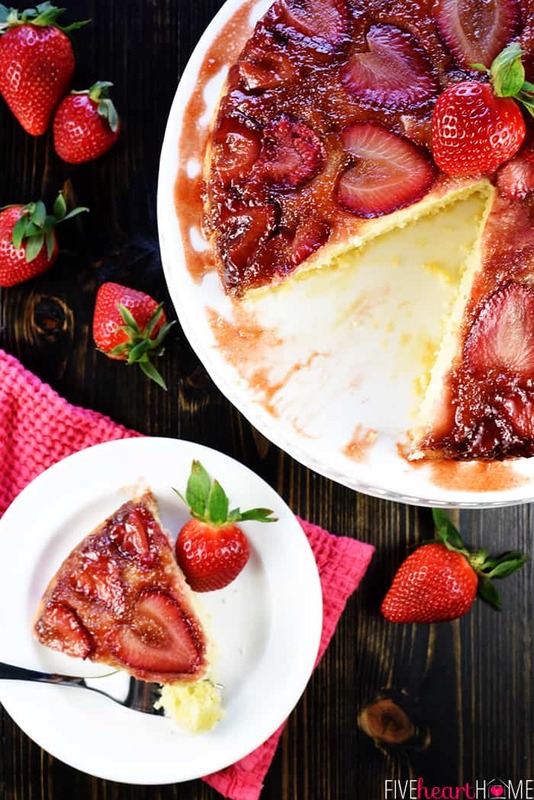 The strawberries will practically melt away into the cake if they’re sliced too thin, so try to cut them at least 1/4-inch thick. And keep in mind that if you slice your strawberries on the thicker side, you may end up using close to a full pound of them. If you don’t have light brown sugar, you may use dark brown sugar instead. The cake will release from the pan more easily if you run a thin knife or spatula around the inside of the pan just before inverting the cake. And once inverted, don’t remove the pan immediately…letting it sit for a minute will allow the syrup a chance to soak into the top of the cake without all running down the sides. 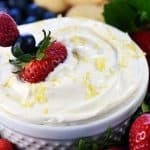 Feel free to switch out the berries in this recipe…blackberries, blueberries, raspberries, or a mixed berry combo would all be delicious! 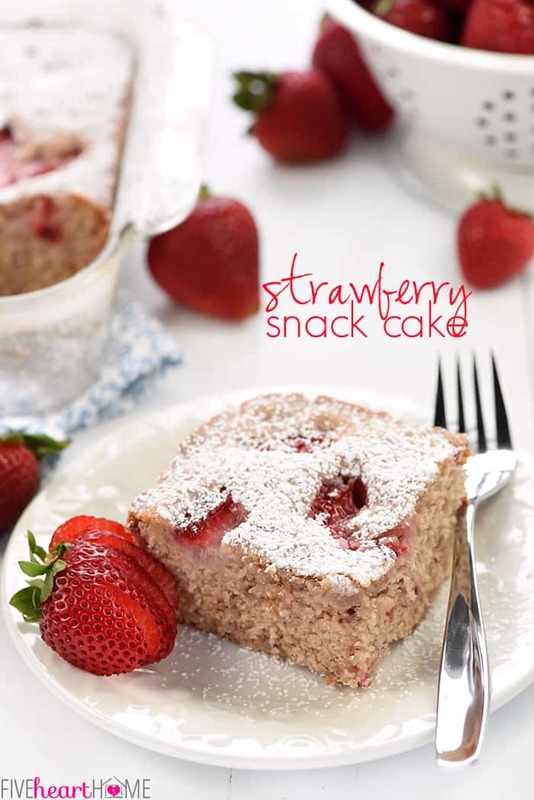 This cake is especially delicious topped with a dollop of freshly whipped cream! A scoop of vanilla ice cream isn’t too shabby either. Position rack in center of oven and preheat to 350°F. Generously grease the sides of a 9-inch round cake pan. Cut the 3 tablespoons butter into small pieces and place in the cake pan. Place the pan in the oven for a minute or two until the butter is just melted. Remove the pan from the oven and swirl the melted butter to coat the bottom of the pan. Evenly sprinkle the brown sugar over the melted butter to form a thin layer at the bottom of the pan. 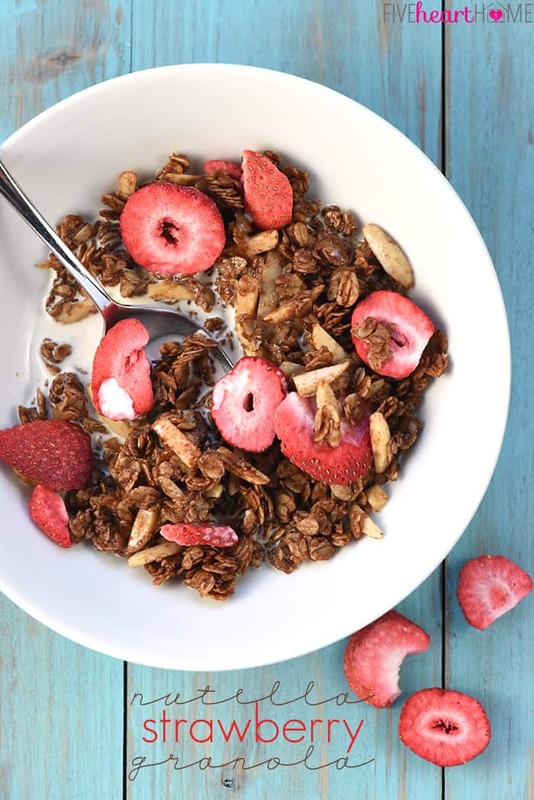 Arrange the sliced strawberries in a single layer over the brown sugar, making sure the slices are touching or slightly overlapping. In a medium bowl, whisk together the flour, baking powder, and salt; set aside. 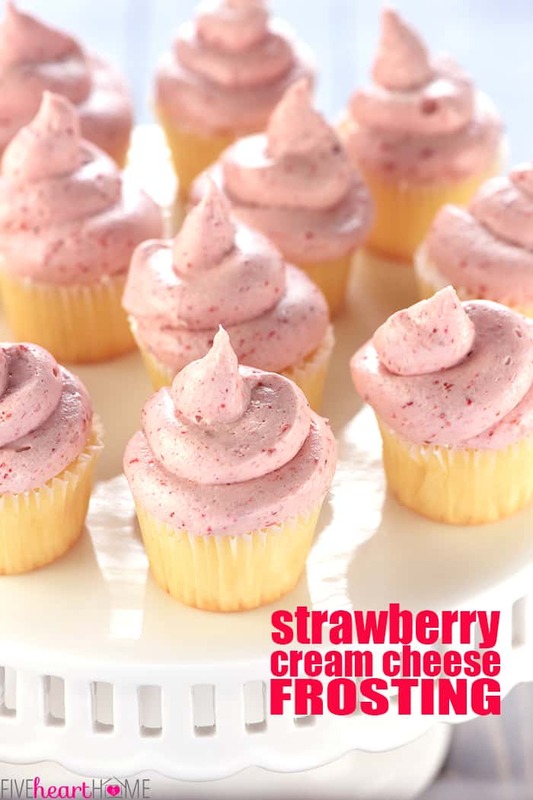 In a large bowl, use an electric mixer to beat the softened butter and sugar until fluffy. Scrape the bowl and blend in the egg and vanilla. Beat on high for 3 minutes, scraping the bowl occasionally. With the mixer on low speed, gradually blend the flour mixture into the wet mixture, alternating with the milk until just combined. 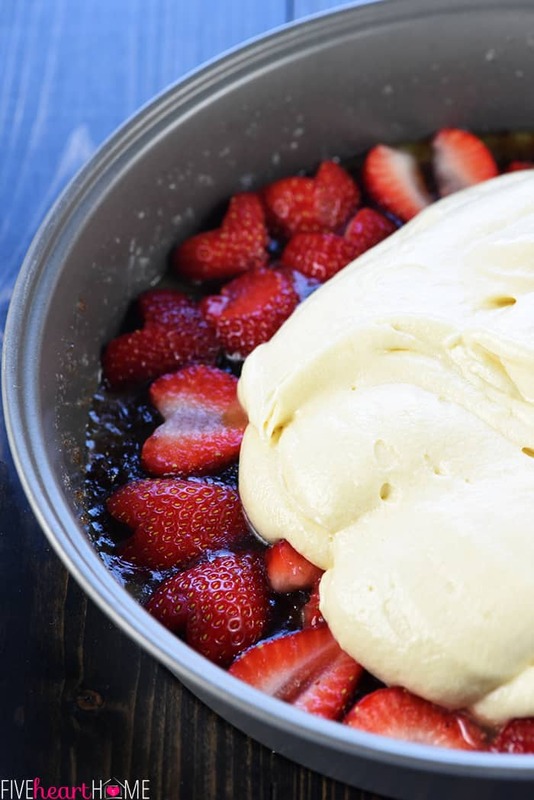 Scrape the batter into the pan and carefully spread over the strawberries. Bake for 28 to 32 minutes or until toothpick inserted in the center of the cake comes out clean. Set the cake pan on a cooling rack and cool the cake in the pan for 3 minutes. Carefully run a thin knife or spatula around the edge of the cake pan, then lay a cake platter on top of it. Pressing down on the platter, quickly invert the pan so that it's upside-down on the platter. Wait for 1 minute and then slowly and carefully lift the cake pan from the top of the cake. 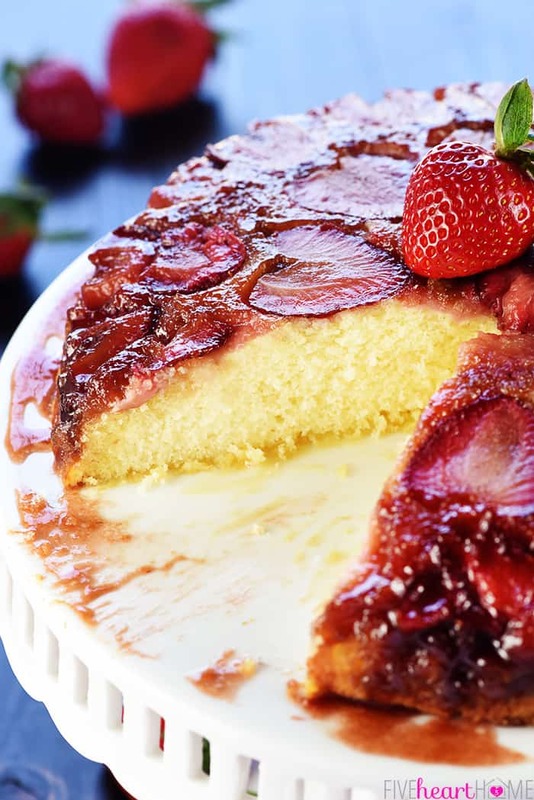 If any berries stick to the pan, place them back on the top of the cake. Serve cake warm or at room temperature. 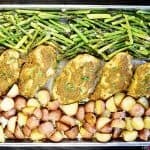 Cool completely before covering and storing leftovers at room temperature for up to three days. I can’t wait to try this! My mouth started salivating when I saw it. Cakes are my favorite and this is kind of a different flavor. So I’m definitely going to try this soon and will let you know how it turned out! Yummy! 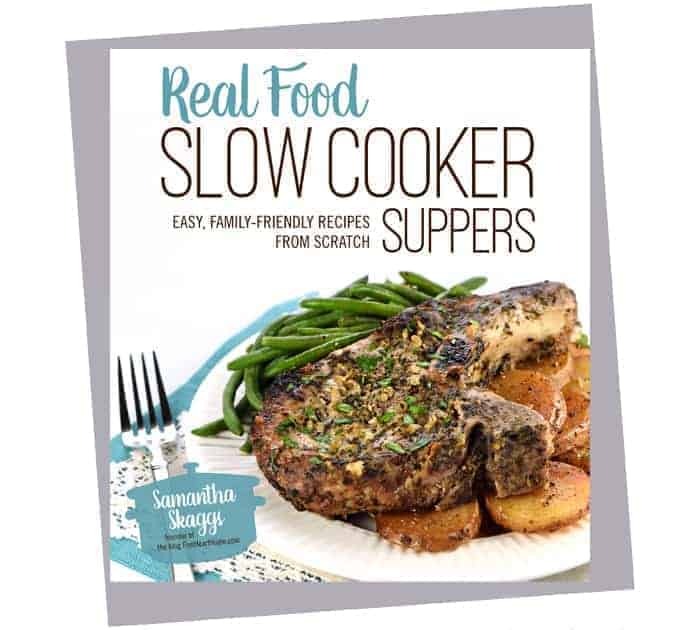 Looks delicious…I think peaches would also be great in this! This was amazing! It was super easy and came out great. My boyfriend even ate 2 pieces the first night which he never does and polished off the leftovers the next night. Thinking of making it again here in the next couple of days. I’m newly retired and have never made a cake. Made this and it came out great. 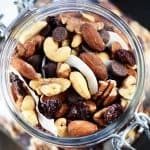 Recipe made me look like a pro! 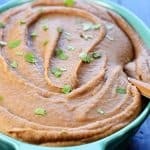 Very easy and delish.